Can you believe it is already that time of year? I am not talking about the holidays, but Parent Teacher Conferences! I will be going to my boys’ conferences on Thursday. I am anxious just writing about it. Like many of you, I have concerns about my sons’ progress. Time and time again though, I hear more parents express deep concern about their child’s progress in reading. Reading is the one skill that a student must be proficient in to be successful in all other subjects. “Reading” not only means a child’s fluency, but their comprehension of the text too. Talking with your preschoolers about signs in their environment. Showing your children you enjoy reading themselves. Reading to your child and pointing to the words as you read. This helps children begin to notice words and that words have meaning. They also gain an awareness of the conventions of reading, such as left to right progression, and from the top of the page to the bottom, and that sentences are made up of words. Being a good role model by allowing your child to watch you read. Reading ALOUD often to your child even if they are in 3rd, 4th, or 5th grade. Providing a variety of reading materials such as books, magazines, and poetry in a vast array of topics. Encouraging activities that require reading such as reading a recipe, making and following a grocery list, or researching their favorite sports team. Establishing a consistent reading time. My family’s reading time is before bedtime. Writing notes to your children…stick it in their lunch box, post it on the fridge and encourage written responses. Having your child read to their younger brother or sister. This helps with fluency, expression, and comprehension. *Excerpted from: Swanson, B. B. (2001). 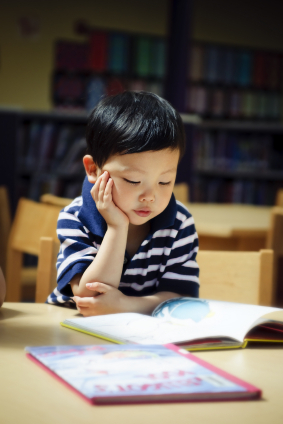 How Can I Improve My Child’s Reading? Parent Brochure. ACCESS ERIC. To see what reading programs Little Scholars offers, check out our enrichment programs list. We have not extended our services to Middle Schoolers as well!